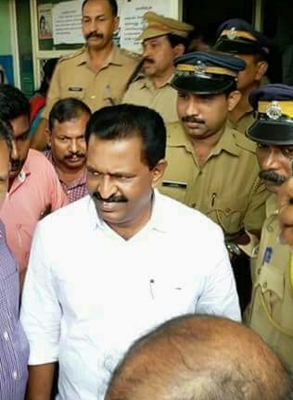 Thiruvananthapuram, July 22 (IANS) Kerala Congress legislator M. Vincent was on Saturday arrested, a day after being charged with sexual harassment and stalking of a 51-year-old woman who attempted suicide earlier this week. A court here sent him to 14 days judicial custody. This is the first time that a sitting legislator in Kerala has been arrested on such charges. Before being arrested, Vincent, a first-time legislator, was grilled for over two hours by a team of police. The police team arrived at the legislator’s hostel here around 12.40 p.m. and left after more than two hours of questioning. He later was moved to an undisclosed location for further interrogation and then arrested before being brought to the state police headquarters. From the police headquarters he was taken to the Neyattinkara government hospital for a medical checkup, after which he was brought to the Neyattinkara police station where he was interrogated some more. Speaking to reporters while being taken to the court in the evening, Vincent said he has been politically targeted and the office of the Chief Minister is responsible for his arrest. “My legal battle to come out clean begins from now. I will not quit as legislator,” Vincent told reporters. On Monday he will move for bail. Vincent had moved for anticipatory bail from a court here, but with his arrest taking place he will now seek bail on Monday. The woman’s husband had filed a complaint with the local police station near here accusing the legislator of threatening and harassing his wife over phone. Vincent, who represents Kovalam Assembly constituency in the state capital district, said he has done no wrong and claimed he was a victim of political conspiracy. The case surfaced after the woman attempted suicide by consuming excessive dose of sleeping pills on Wednesday. She was rushed to a hospital in the city suburbs and was saved. The police had earlier taken the statement of the woman. The woman told the media on Saturday that she has been facing severe mental harassment from the legislator and he has misbehaved with her on two different occasions. The police probe team is being headed by Kollam Superintendent of Police S. Ajeetha Begum, who also joined in the questioning of Vincent. Reacting to the arrest, Chief Minister Pinarayi Vijayan said that as soon as the complaint surfaced his government decided to appoint a woman IPS officer to probe the case. “The message that we wish to send across is about our commitment to women’s safety and protection. Anyone, irrespective of what his position is, will have to face action if a wrong has been done,” said Vijayan. State Congress president M.M. Hassan said that this was a case of political scores being settled. “The Congress party will take a decision once the court takes its decision,” said Hassan. Senior Congress leader Joseph Vazhakan said it appears there was “undue haste” by the police. “In the past also legislators have been named as accused in similar cases, but never has this sort of haste been shown. We fully agree that law should take its course, but there should not be undue haste and that’s what has happened in this case,” said Vazhakan. Senior women leaders in the Congress party M. Bindu Krishna and Shanimol Usman have asked Vincent to step down as legislator and face the probe. Angry youth activists of the CPI-M took to the streets in the state capital and burnt an effigy of the legislator. Thiruvananthapuram district CPI-M secretary Anavoor Nagappan told the media that Vincent should quit in the wake of the serious charges against him. Leader of opposition and senior Congress leader Ramesh Chennithala after hearing about the arrest of his party colleague said this is something extraordinary. “The party views this as a serious issue and will take it up on July 25 when the Congress-led UDF meets,” said Chennithala.